Paul Cézanne famously declared "I seek in painting." He spoke of his art in almost spiritual terms, as a quest to reach the distant goal he referred to as "realization." In a letter of 1904, the 65-year old master wrote that "I progress very slowly, for nature reveals herself to me in very complex ways; and the progress needed is endless." The next year, he confessed his fear that "My age and health will never allow me to realize my dream of art that I have been pursuing all my life." In 1906, a month before his death, he wrote that "I am always studying after nature and it seems to me that I make slow progress," but he confided to his son that "I am so slow in expressing myself that it makes me very sad." The irony of Cézanne's frustration at the end of his life stems from the fact that it was his most recent work that would later be considered his greatest, and would directly inspire every important artistic development of the next generation. 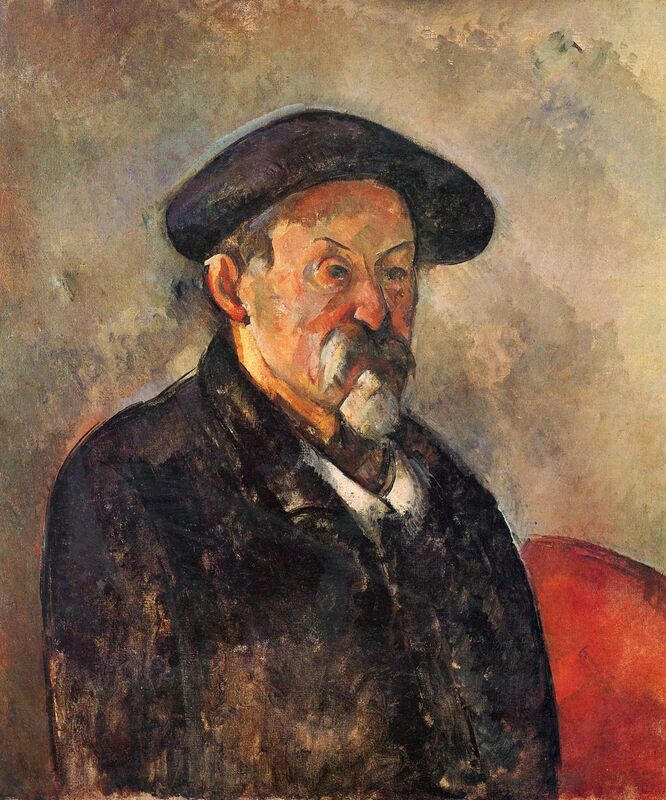 Paul Cézanne, Self-Portrait (1900). Image courtesy Wikimedia Commons. I cannot attain the intensity that is unfolded before my senses. I have not the magnificent richness of coloring that animates nature. Here on the bank of the river the motifs multiply, the same subject seen from a different angle offers subject for study of the most powerful interest and so varied that I think I could occupy myself for months without changing place, by turning now more to the right, now more to the left. As Cézanne grew older, his constant application made his vision more acute, allowing him to distinguish ever smaller gradations of color and form in nature. But his increased sensitivity made it ever more difficult to create the precise colors on his palette, and to make the necessary marks with his brush, that would accurately render his perception of the object he was portraying. When asked what fictional character he most admired, Cézanne responded: Frenhofer. Frenhofer was created by Honoré de Balzac in the novella The Unknown Masterpiece (1837). He was an aged master who had spent his life in pursuit of an elusive artistic ideal of beauty, and had devoted a decade to creating one perfect painting: "It's ten years now, young man, that I've been struggling with this problem. But what are ten short years when you're contending with nature?" He wanted no less than to bring his figure to life: "She breathed! Though I thought I'd learned how to render nature's depth and solidity on a flat canvas, this morning, by daylight, I discovered my mistake." 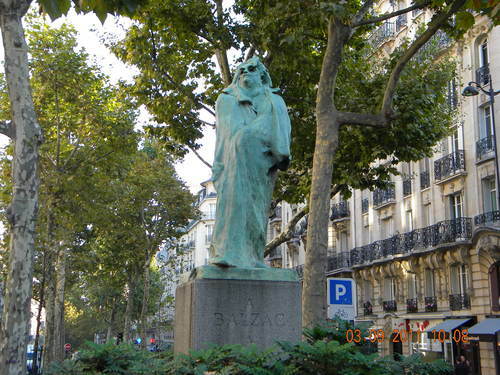 Auguste Rodin, Monument to Balzac, in Paris. Image courtesy Wikimedia Commons. Porbus, another painter, described Frenhofer's predicament: "Frenhofer's a man in love with our art, a man who sees higher and farther than other painters. He's meditated on the nature of color, on the absolute truth of line, but by dint of so much research, he has come to doubt the very object of his investigations." Porbus warned a young painter to avoid Frenhofer's uncertainty: "practice and observation are everything to a painter; so that if reasoning and poetry argue with our brushes, we wind up in doubt, like our old man here...Don't do that to yourself! ... A painter should philosophize only with a brush in his hand." Frenhofer himself was beyond help. His pursuit of the impossible led to failure and despair, and the final sentence of the story revealed that he had died after burning all his canvases. Balzac was intrigued by the problem of artistic creativity, and the tension between doubt and achievement. He was an experimental writer, who revised obsessively. He made Frenhofer a paradigmatic example of the vicious spiral that many experimental artists fear, in which the experimentation that yields greater knowledge might lead addictively to the need for more experimentation. The growth of wisdom might become tied inextricably to greater uncertainty and doubt, with destructive consequences. One evening I spoke to him of Le Chef d'oeuvre Inconnu and of Frenhofer, the hero of Balzac's tragedy. He got up from the table, stood before me, and, striking his chest with his index finger, he admitted wordlessly by this repeated gesture that he was the very character in the novel. He was so moved by this feeling that tears filled his eyes. Someone who had lived earlier, but whose soul was prophetical, had understood him. Unlike Frenhofer, however, Cézanne never yielded to his doubt. A week before his death, in what would be his final letter to his son, he wrote: "I continue to work with difficulty, but in the end there is something. That is the important thing, I believe." Even today, his perseverance remains a source of inspiration to experimental artists, just as Balzac's fictional character was a source of inspiration to him. To follow what's new on Facts & Arts please click here.